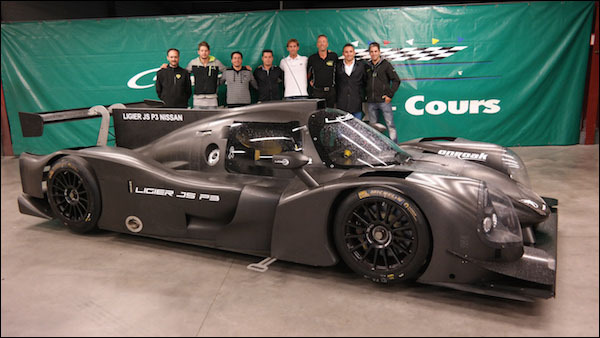 The latest announcement of an LMP3 effort sees the newly formed SPV Racing, a Spanish and Swedish alliance between SPV Motorsport and Spirit Racing acquire a pair of Ligier JS P3 for the LMP3 class of the European Le Mans Series (ELMS) in 2016 and 2017. From there, the team’s ambition is to progress to LMP2 in 2018, with a plan to enter the Le Mans 24 Hours in 2019. The team carried out their first tests in the car at Magny Cours on 16 September with a selection of Swedish and Spanish drivers. Sweden’s Fredrik Blomstedt, a British GT driver in 2015, was first out on the slightly damp club loop followed by Spanish drivers Borja Garcia, former test driver for Toyota and Williams F1, and Alan Sicart, Ferrari GT driver. The team’s base is on the Costa del Sol, Malaga – Coin, in southern Spain, where a new base is being established close to the Ascari and Jerez Circuits. The team’s home track will however, be Circuito Mike G Guadix outside Granada. Raul Garcia will act as the team’s technical director, who has in the past acted as chief mechanic at the Ascari facility and built up the SPV Motorsport operation to service and support race cars up to and including Formula 1. In 2015, SPV has supported a number of cars in various series including the 24-hour series in Europe at Imola, Spa, Nürburgring and Barcelona and will start the 2016 season with the Dubai 24 hours. Spirit Racing has a background in Endurance Racing, but in 2015 focused on competing in Karting with the Rübig Mega 650cc Kart in the Euro Trophy series, winning with Moa Dahlman even before the finals at Wackersdorf in Germany on October 10th. Moa Dahlman who is 18 years old has a track record in Karting that is equal to her Swedish compatriot and Sauber F1 driver, Marcus Ericsson. Moa will get her first chance to test the Ligier JS P3 this winter when the team will give three promising young drivers an opportunity to work with experienced drivers and engineers on five occasions at three different tracks in southern Spain as part of the SPV Endurance Academy.